What is an online library catalog? Home » A Primer on Databases and Catalogs » What is an online library catalog? An online library catalog is an electronic bibliographic database that describes the books, videotapes, periodicals, etc. carried by a particular library. The online library catalog evolved from a printed source, the library card catalog. Before the advent of online catalogs, library catalogs were pieces of furniture that contained numerous small drawers. In these drawers were contained the records of particular items in the library. A copy of John Grisham's The Firm might have four different cards filed in the different catalog areas: one for the author's name, one for the title, and one for each subject heading, like those below. You could only search one element at a time and this could take quite a bit of time from your schedule. 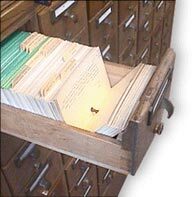 Very few libraries in Georgia have card catalogs anymore, but you might see the chest of small drawers hidden in a dark corner in some libraries.